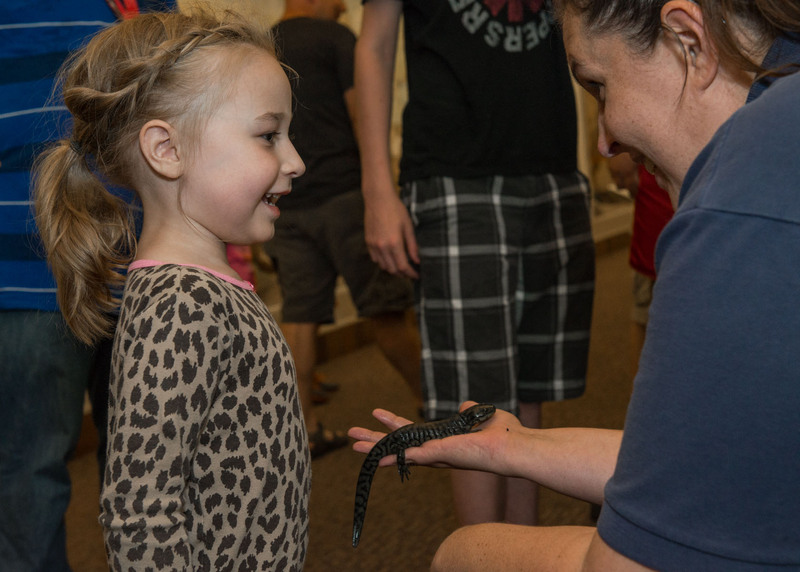 A young visitor learns more about salamanders during a live animal encounter with the Nebraska Game and Parks Commission's Project WILD during "Archie's Late Night Party" in 2015 at Morrill Hall. Archie and his fossil friends at the University of Nebraska State Museum are staying up late to explore science and natural history topics on June 24. "Archie's Late Night Party," an all-ages event at the museum, will feature hands-on activities in fields such as astronomy, chemistry and zoology, from 6 to 10 p.m. in Morrill Hall, immediately south of 14th and Vine streets. Families will be able to learn more about nocturnal animals and examine the night sky. Activities include live animal encounters, Mueller Planetarium fulldome shows, the science of Harry Potter and constellation identification. Visitors will be able to take a short walk to the UNL Student Observatory to look at the night sky through telescopes and curb late-night cravings with snacks from the "Fresh Thyme Late Night Snack Shack." Children are encouraged to wear pajamas for bedtime stories with Archie and Lincoln City Libraries. Participating partners include the Nebraska Game and Parks Commission's Project WILD, the Spring Creek Prairie Audubon Center, Space, Cyber and Telecommunications Law in the University of Nebraska College of Law, the UNL Student Observatory, Lincoln Parks and Recreation's Pioneers Park Nature Center, the Lincoln Children's Museum, Lincoln City Libraries, Egad! Science, and professors and students in the UNL Departments of Chemistry and Biological Sciences and the School of Natural Resources. Event sponsors are Fresh Thyme Farmers Market and the Shopko Foundation. For ticket and event information, click here or call 402-472-2642. 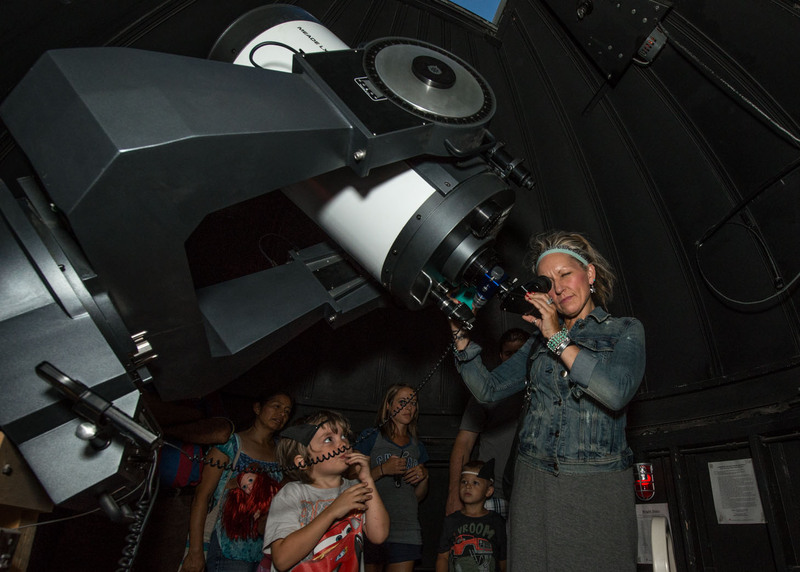 Visitors look through a telescope at the UNL Student Observatory as part of "Archie’s Late Night Party" in 2015.